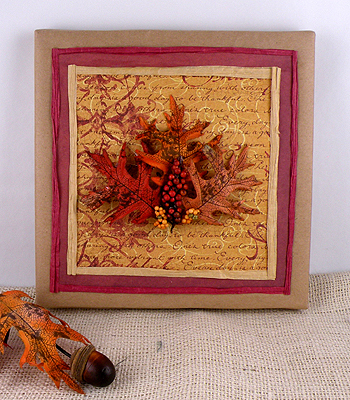 Autumn inspired elements and fall tones create a beautifully decorated gift design perfect for any occasion. Scotch® Quick Dry Tacky Glue easily secures fabric leaves to the gift to add an ornamental accent. This is my latest design I created for 3M/Scotch Brand. This entry was posted in Everything, Gift Wrapping, Recycle, Uncategorized and tagged autumn leaves, brown paper bag, gift wrap, Gina Tepper, leaves, recycle, scrapbooking paper. Bookmark the permalink.